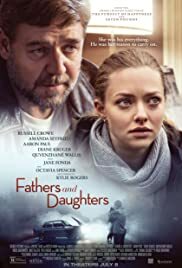 Fathers and Daughters is a 2015 American-Italian drama film directed by Gabriele Muccino and starring Russell Crowe, Amanda Seyfried and Kylie Rogers. It is based on a 2012 script written by Brad Desch, which was included in the 2012 Black List survey. Russell Crowe is a Pulitzer prize-winning novelist who… no, stop there, I don’t buy it. Just like I don’t buy Crowe’s am-dram post-traumatic stress seizures (something for the Oscar judges, sir? ), his brow-furrowing typing, his cutesy-goofy parenting (“you’re my potato chip”) or, indeed, any other part of this ludicrously overegged symphony of phoniness from Gabriele Muccino, director of the equally fatuous Seven Pounds. “It’s about life, about death, loss, about love and fear to lose the person you love,” burbles Muccino of Brad Desch’s unaccountably Black List-approved script, which splits its time between dad-slash-author Jake (Crowe) raising young daughter Katie, and grown-up Katie (Amanda Seyfried) wrestling with lovelorn daddy issues.